Lent is a time to intentionally create space for focusing more deeply on Jesus’ life, death, and resurrection. As Western Christians throughout the world have entered the Lenten season, and Eastern Christians will begin on March 11th, we’re sharing some ways in which Christians in Boston are participating in Lent. There may be an idea that will spur you on in your own Lenten devotion and practice! An Evangelical Perspective – “Lent is a season of preparation. It’s a season where we give up good things so we can focus on better things. It’s not a rote ritual of fasting simply so we can fulfill a religious requirement. It’s an opportunity to give up some things for a season, so we can focus on Jesus and align our hearts with his.” Reunion Christian Church is participating in an “Experiential Fast,” where each day and week is focused on a particular element of fasting and devotion. A Catholic Young Adult’s Ministry – St. Mary’s of the Assumption Parish in Brookline is participating in “Theosis in Action,” which is an online community to help provide resources for young adults to grow in their faith and opportunities for fellowship as they navigate through adulthood. Theosis in Action is hosting an online Bible study during Lent on Sunday evenings with the focus of “Journey Back to Christ” that all people are welcome to participate in. We’re also featuring a blog article written by Rev. Rita Powell, priest at Trinity Church Boston and UniteBoston board member. Rev. Rita shares about her Lenten practice of taking the daily office outside to God’s creation. If you’d like to add how you or your church are participating in Lent this year, email kelly@uniteboston.com May God meet you deeply in this season of physical and spiritual devotion! If you have ever gotten an email from me, you have seen this quote in my signature, “Nor can foot feel, being shod.” It’s from the famous poem by Gerard Manley Hopkins called God’s Grandeur. It is one of the anchoring texts in my life. The opening line is “The world is charged with the Grandeur of God.” In that one phrase, Hopkins captures both the way that the world is filled with God as with electricity—an unseen but real force of energy and a fullness that shimmers—and the way in which we, as that world, are accountable to God. We are “charged with”—filled with and responsible for—all the grandeur. The poem goes on to reflect on all the ways in which we have obscured that noble calling. Our world, our economy, our carelessness with the earth—all create a way of life that dulls the force of that electrical charge that is the divine life. And so the poem brings us to the line in my email signature- “nor can foot feel, being shod.” Our way of life swaths us in comforts and normal routines that blind us, dull us, diminish us. We grow far apart even from our own bodies. I wear shoes every day. I am not connected to the earth or my own body the way I might be. That line in my email is meant to remind me of this flaw daily. So this Lent, I’ve decided to take my daily office (a distilled version of it with a big chunk of silence) outside. To behold, in prayer, the God who is in creation. I have found a small corner of a ruined foundation in the meadow behind my neighborhood, and am determined to pray out there each morning in Lent. I have to say, the massive snowfall and plummeting temperatures are not quite what I had been hoping for! And I will be wearing boots, thank you very much. But I will try to begin again this season, to recall the charge we are placed under as members of the grandeur of God. Big News! UniteBoston is featured this week on the Neighborly Faith Podcast! Neighborly Faith Podcast hosts Kevin Singer and Chris Stackaruk searched nationwide for the cutting edge of Evangelical-Catholic ecumenism, the work towards unity among Christians. They traveled to Boston and Chicago to investigate the status and future of Evangelical-Catholic relationships in these cities, interviewing pastors & priests, professors, laypersons, seminarians, and musicians from both traditions. In their extensive and exclusive interviews, they investigate: What can today’s leaders in ecumenism teach us about the future between these two traditions? First Impressions of Evangelicals/Catholics…and Why They Changed: Leaders talk about their first impressions of the other, and how those impressions are changing. Why is Christian Unity Difficult? : What are the hindrances Evangelicals must overcome in order to engage better with Catholics? What Does Christian Unity Look Like?What does unity realistically look like in our world today? Evangelicals and Catholics Working Together: How are Evangelicals and Catholics working together now for the betterment of their churches, communities, and societies? Here are links to the series: SERIES // SITE. These episodes would be great to listen to on a morning commute! Here is the link to the “Evangelicals and Catholics Working Together” episode that features UniteBoston. Please share this resource as widely as you are able. We’d love for the series to reach all who care about the future of Evangelical-Catholic ecumenism. Did you know that there is a Christian community of vowed women in Brighton, whose mission is to realize Christ’s prayer “that they would be one,” and seek to work for unity and reconciliation where there is brokenness? Since 1873, these Sisters of St. Joseph have worked in schools, parishes, hospitals, nursing homes, retreat and campus ministry centers, refugee services, literacy programs, shelters, food pantries, and more. The Sisters of St. Joseph of Boston are excited to host the 2018 “Make a Difference in Allston/Brighton” this Monday evening in Brighton. Their press release describes that this event, “seeks to honor the great work of active volunteers in Allston/Brighton and to recruit new volunteers for the 20 different non-profit organizations that will be represented.” These organizations all share the common goal of “loving the dear neighbor without distinction” throughout Allston/Brighton. We encourage the UniteBoston community to support their great work to serve and love our neighbors in Allston/Brighton. This is a great song from Zach Williams filled with great truth! We are so excited to have Zach joining us at this years Worship In The Adirondacks 2018. For details and tickets go to www.worshipintheadirondacks.com. 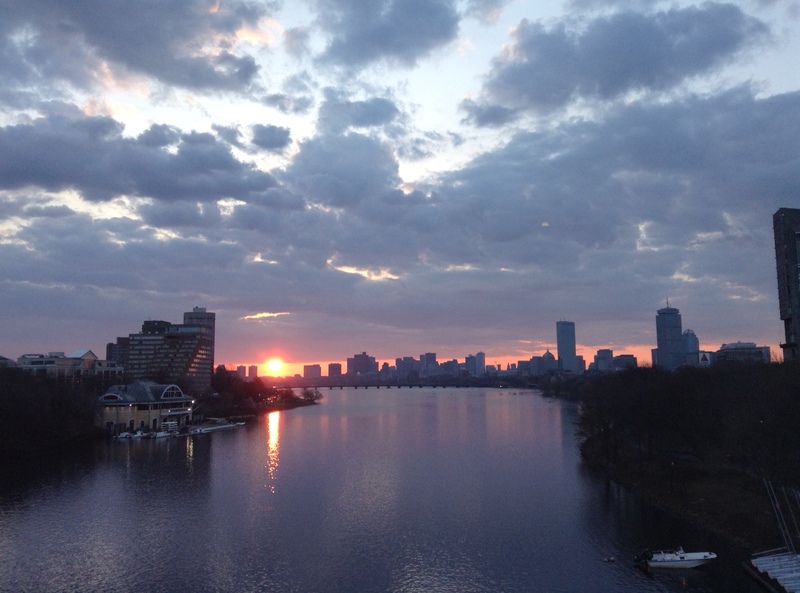 Today, Kelly Steinhaus, UniteBoston’s Team Leader, shares her perspective on God’s destiny for the city of Boston and how this is reflected in what is currently happening within the Christian community. Do you like watching the sunrise? I sure do. Whether or not you prefer to wake up that early in the morning, we are in an amazing time where God is rising over this city, awakening hearts and calling people to the place of prayer. Isaiah wrote this message to the city of Zion, the heavenly Jerusalem, and I believe it’s also a representation of what God wants to do in here in the city of Boston. You see, Boston’s destiny is to be a beacon of the nations. Thus, the question becomes: what do we want to be known for? Currently, Boston is one of the smallest world-class cities, known for its rich history and being an intellectual hub. With over 300,000 college students, Boston is a popular place to come to pursue high-class education. But I believe that God has so much more for us – This is only the beginning. What if Boston were to be known for the way the Christian community works together? As a city where people pray? As a place where love is displayed? If you’re intrigued by this, I’d encourage you to listen to the short message that I shared on Easter at the first Awaken Winchester service. We all cry out for revival but don’t realize that what brings revival is repentance. Two weeks ago, Dr. Paul Jehle gave a lecture on the spiritual history of Massachusetts – he said that the Great Awakening was a direct result of the repentance that happened after the Salem witch trials. I’m convinced that God wants to bring revival to Boston, we’re not ready for it. Our light shines brightest when we extinguish the darkness, so my prayer is for conviction and changed hearts, that we might be capable for the revival God seeks to pour out. Brothers and sisters in Christ, may we arise and shine, so that the glory of the Lord can come upon us, that Boston might be awakened to its destiny as a city on a hill and a light to the nations. 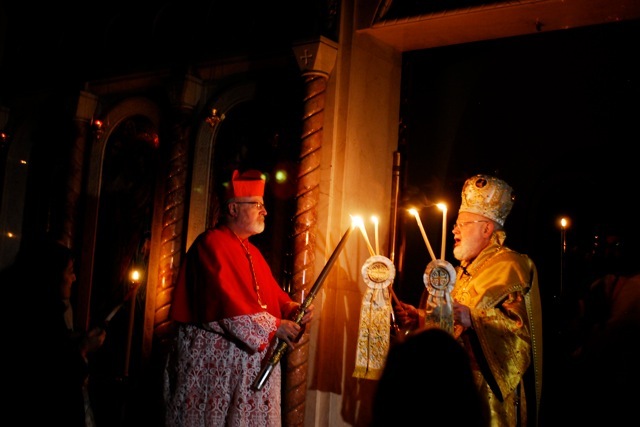 Below: A photo of His Eminence Sean O’Malley of the Boston Catholic Archdiocese and His Eminence Methodios of the Metropolitan of Boston of the Greek Orthodox Church joining together to light the first candle of Easter night. Photo taken by Alexander Mavradis.